Altogether 3, 214 candidates are in the fray for panchayat election in Dibrugarh district. A voter cast his vote in a polling station in Dibrugarh on Wednesday. Dibrugarh district in Assam witnessed peaceful voting in the first phase of panchayat polls on Wednesday. Long queues were seen in front of the various polling stations in the district since morning as the polling got underway from 7 am. In some polling stations voting continued till 5 pm due to huge turnout of voters in the afternoon hours. 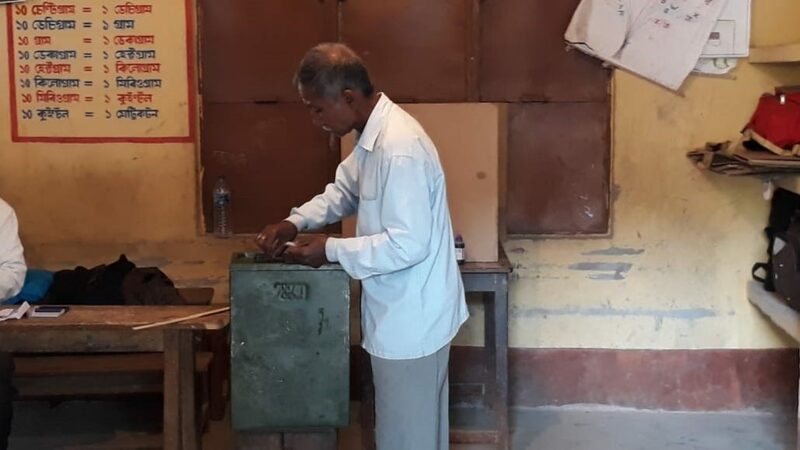 Pollov Kumar Chakrovorty (48), a resident of Kumaronichiga under Rajbhetta gaon panchayat in Dibrugarh, who cast his vote in the early morning, said “I want development of panchayat because lots of funds are sanctioned for panchayat bodies but the development process is very slow. Roads are not properly built and we have to face problems because of the poor road infrastructure. I am very happy to cast my vote as I am hoping for a change”. He said corruption and anomalies were rampant in the panchayat bodies elected in 2012 and the funds meant for development were siphoned off by the corrupt panchayat leaders. “So, this time we are hoping for a clean and stable panchayati raj system,” he said. Altogether 3, 214 candidates are in the fray for the panchayat election in Dibrugarh district for 23 zila parishad member seats, 93 gaon panchayat president seats, 93 anchalik parishad member seats and 930 gaon panchayat member seats. “The polling took place in a peaceful manner. There has been no report of any untoward incident,” a poll official said. For the 23 zila parishad member seats, BJP and Congress are contesting in all the seats while AGP has put up candidates in 19 seats. For 93 gaon panchayat president seats, BJP and Congress are contesting in all 93 seats and AGP is contesting in 79 seats, followed by CPI (M) in six seats, CPI (ML) in five seats and Independent in 12 seats. For the 93 anchalik parishad member seats, both BJP and Congress are contesting in 92 seats each, followed by AGP in 74 seats, CPI (M) in 5 seats, CPI (ML) in 4 seats and Independent in 1 seat. For the 930 gaon panchayat member seats, BJP has put up candidates for 924 seats, followed by Congress in 902 seats, AGP in 678 seats, CPI (M) in 29 seats, CPI (ML) in 26 seats and Independent in 34 seats. The polling percentage in the district till the last information is 67%. However, the final official percentage is yet to be declared.